Seeking Support For Late PMRD Fellow Suramoni's family. The picture above belongs to Suramoni Boro, a Prime Minister's Rural Development Fellow, who worked relentlessly to improve the status of education in Balrampur, Chhatisgarh. There are some people who lose themselves in their work. Suramoni went beyond He lost his life, in an unfortunate accident. 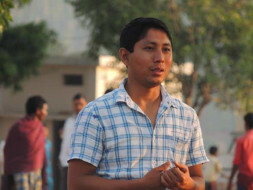 Suramoni's family which has his parents, a younger brother and brother's wife and little son, was completely dependent on him.As Suramoni's friends, everyone is trying to contribute. We wanted to do our bit and use our birthdays as a means to this. Hence this compaign. The proceeds from the campaign would go a common fund which would be used to ensure a monthly income for Suramoni's parents. My brother and I have started this campaign on our birthdays. We Viditya and Aditya, children of SuryaDutt and Vijaya, request you to help us have a meaningful birthday.